Will the boulder catch Thomas or will Thomas get to it first? The Boulder Mountain layout is very distinctive, with the peak at the heart of the track and it's daunting looking boulder perched on top! 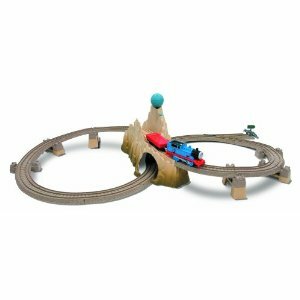 This large set is action packed and contains Thomas engine with a wagon, signal points, track buffer and a sign to a new Sodor destination! It also shows you the next compatible set so you can collect them all! The Thomas at Boulder Mountain Set is one of the most exciting in the range and the ultimate addition to any Thomas collection!